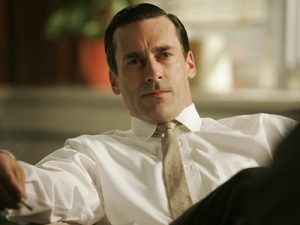 Actor Jon Hamm who play leading man, Don Draper in the amazing AMC series ‘Mad Men’ will not only be in front of the camera for season five, but will also be behind the camera directing at least the season five opener. This will mark Hamm’s directorial debut. The production of season five will start in August of this year with a March 2012 premiere. Wow. Way far off, but this is cool news nonetheless. John Slattery directed an episode of ‘Mad Men’ last season which Slattery plays Roger Sterling. This entry was posted on Friday, May 27th, 2011 at 11:23 am	and is filed under Film, News. You can follow any responses to this entry through the RSS 2.0 feed. You can skip to the end and leave a response. Pinging is currently not allowed. « Director David O. Russell Leaves ‘Uncharted’ Film!! !